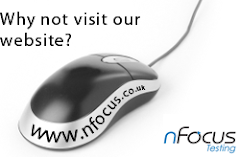 nFocus Blog: Software Testing Event - Last days to register! Software Testing Event - Last days to register! "Getting the most out of Test within Visual Studio 2010, in the Azure Cloud!" With projects moving to more iterative approaches like agile, why should I tightly integrate testing into the application lifecycle, and how can I use Visual Studio 2010 to help me? As you may be aware you have been shortlisted for your category in the Computer Weekly IT Blog Awards 2010. We would like to invite you to the awards. If you reply via email by Monday 25 October, I will be able to send you a formal invite to the event.